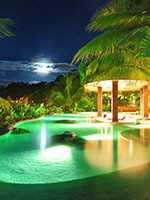 Club Rio Adventure Package | The Springs Resort Arenal | Costa Rica Tour Deals! If you are a fan of reality TV, then you probably recognize Arenal’s The Springs Resort from Bachelor in Costa Rica or more recently Keeping Up With The Kardashians. The Springs Resort is most famous for its spectacular views of the Arenal Volcano from nearly every room and vantage point within the property. 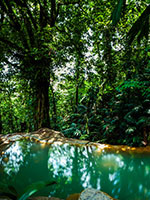 Oh, did we mention acres of lush vegetation all sculpted around the many natural hot springs throughout the property? The Springs Resort is hands down the most luxurious hot springs resort surrounding Arenal, just ask anyone who has been there. Lucky for us, the creative minds that sculpted this incredible resort realized what amazing potential their lower property had and dreamed up the Club Rio Adventure Park. 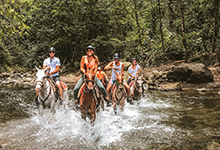 Aside from exploring the acres of natural hot springs, the Club Rio Adventure Park offers horseback riding, tubing or kayaking on the Arenal River, a climb and rappel wall and guided nature tours through the extensive wildlife preserve. Club Rio is perfect for the whole family to enjoy together. Like its sister property, Peace Lodge & La Paz Waterfall Gardens, The Springs Resort is also home to their own Wildlife Preserve. 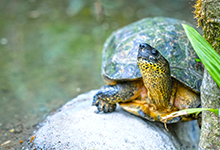 The Wildlife Preserve is a sanctuary for Costa Rican animals that have been confiscated from poachers, donated from individuals, or donated by other private animal preserves in Costa Rica. A guided visit to view some of the wildlife living here such as jungle cats, sloths and monkeys are integrated into some of the tour options, however entrance to the wildlife preserve is included with your Club Rio Adventure Package. Words cannot begin to describe everything you can find in this little piece of paradise in Costa Rica. You really just need to experience it for yourself! 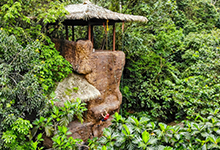 Aside from all the amenities at The Springs Resort, The Club Rio Adventure Package includes 2 of the activities listed on the tabs below, round-trip transportation from select La Fortuna area hotels, and a traditional Costa Rican lunch. If 2 activities is not enough, you can add on any additional activities for reasonable price. Visiting The Springs Resort really is a must do activity in Arenal, and the Club Rio Adventure Package is one of the best deals in Costa Rica. Book your discounted Club Rio Adventures today! Inflatable kayaks, or "duckies", are perfect for exploring the Arenal River as it winds it way through the scenic Arenal Canyon. 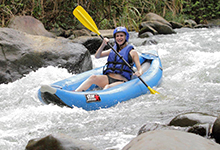 If you have never tried river kayaking before, inflatable kayaks are super easy to navigate and are the perfect vessel for the class II rapids on this stretch of the Arenal River. Certified river guides will help you gear up and learn the basics of river kayaking. We supply all the safety equipment such as helmet and life vest, you just need to bring secure water shoes, bathing suits and shorts and be ready for fun! After your river kayaking adventure, you can sooth your muscles in the natural hot springs. As a bonus, your guide will also take you to visit the jungle cat preserve. The minimum age to paddle your own kayak is 12, however kids as young as 7 can go with one of our certified guides. Please just specify the ages of your children on the booking form. If you forget your water shoes, rentals are available for just $4 per day. Departures: Day pass is valid from 9am to 10pm. Meeting is 15 minutes prior to any activity at lobby of The Springs Resort. Shuttles run every 30 minutes from The Springs Resort to Club Rio Outdoor Center. Departure times for each activity vary. Hotel pick up and drop off is available at select hotels, however the transportation does not arrive to The Springs Resort in time for the early morning tours. Please check the departure times of the activities you wish to participate in to ensure they have openings at 11am or later. Length: 4 to 13 hours, your choice if driving yourself! Children: All ages welcome! Bring the whole family! Children 12 and under pay a discounted rate. Note that not all additional activities are suitable for all ages. Please note the age restrictions noted on each activity tab. Very important note to parents! Children under 16 must be accompanied by adults at all times. This is a natural park, not a man-made water park. The river can be dangerous for children left unattended. Please do not allow children that do not know how to swim in the hot springs or river. The staff at Club Rio is not responsible for the care or discipline of your child. If the staff feels that you are not attending to your children safely and responsibly, you may be asked to leave. Insider Tip: If you really want to make a full day of it, drive yourself, show up early and stay until closing! You can get an Uber for about $10 or so each way and the extra time is well worth it. Restrictions: Be aware that there is no life guard on duty. You will be asked to sign a waiver and assume your own risk while at Club Rio. River currents can be swift. If you cannot swim, you should not partake in any river activity. Please use common sense at all times. Anyone under the influence of alcohol or drugs will not be permitted to participate in any of the activities. Club Rio Adventure Package Tour deposit is $25.00 per Adult and $15.00 per Child. 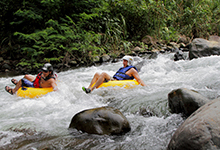 Adventure seekers will want to choose the full 1.5 hour river tubing course that stretches over 800 meters along the Arenal River. Don’t worry about your bum, our special river tubes have protective bottoms and handles so you can bump and bounce down the river without worrying about the rocks. Our river guides will suit you up with all the proper safety gear such as helmets and life vests, just be sure to bring secure water shoes. For those who are a bit river shy, you can choose to just enjoy the 180 meter lower section of the Arenal River. This section of river tubing is very scenic and relaxing. Either way, our safety kayakers will guide you down the river along the best routes so you can be sure you will have the best river tubing experience at Club Rio. Children can ride their own river tube from 8 years on, but they have to be able to fit in the tube properly. Children as young as 7 or those who are smaller than the average 8 year old can ride down with a river guide. If you forget your secure water shoes, no worries, rentals are available for only $4 per day. Saddle up on one of our gentle horses and take a leisurely horseback ride through the luscious tropical vegetation surrounding The Springs and Club Rio properties. This hour long horseback riding tour is perfect for riders of all skill levels. Our horseback riding trails will take you through lush forest, through rivers, and up to spectacular views of the Arenal Volcano and San Carlos plains. The ranchers at Club Rio are proud to teach you about their traditional lifestyles. They are also keen on spotting wildlife in its natural habitat. So keep your eyes peeled as you sit back in the saddle and let the horses lead the way! Children are able to ride as young as 5 years old. Remember to bring a change of long pants with you if you choose horseback riding as one of your 2 activities. Trust us, riding in shorts, especially wet ones, does not make for a pleasant experience. Ready for some adrenaline pumping fun? First-timers as young as 7 can test their rock climbing skills on Club Rio's 15 meter (50') high climbing and rappel wall. The climbing wall at Club Rio is made of special materials that feel about as natural as you can get for a man-made structure. Choose your route wisely, Club Rio's rock climbing wall has various routes at difficulty levels to challenge you. All safety gear is provided including helmets, harnesses and even special rock climbing shoes. Listen to your rock climbing guides instructions carefully and you will reach the top where you can rappel back down the entire 15 meters! The minimum age to participate in the climbing and rappel wall is 7 years old. This 2 hour hike along the “Calcium Canyon” hiking trails surrounding the Club Rio property is the perfect choice for nature lovers. Join our naturalist guides as you explore riverside trails through lush rainforest vegetation. Your guides will help you spot wildlife in its natural habitat. Daily spotting includes colorful poison dart frogs and capuchin monkeys that frequent this region. The opportunities for bird watching are fantastic as well. The property surrounding Club Rio and The Springs Resort is home to over 60 species of birds! Just about any day, owls can be heard and colorful toucans can be seen in the trees while kingfishers zip along the river seeking a meal. There is no minimum age, so the nature hike at Club Rio Outdoor Center is perfect for the whole family to enjoy together. This tour departs at 9:00 AM. Departures: Day pass is valid from 9am to 10pm. Meeting is 15 minutes prior to any activity at lobby of The Springs Resort. Children: All ages welcome! Bring the whole family! Children 12 and under pay a discounted rate. Very important note to parents! Children under 16 must be accompanied by adults at all times. This is a natural park, not a man-made water park. The river can be dangerous for children left unattended. Please do not allow children that do not know how to swim in the hot springs or river. The staff at Club Rio is not responsible for the care or discipline of your child. If the staff feels that you are not attending to your children safely and responsibly, you may be asked to leave. Club Rio Adventure Package Tour deposit is $5.00 per person. Club Rio Adventure Package Tour deposit is $20.00 per person.